Without citizens no Vehicle-to-grid (V2G) and Virtual Power Plant (VPP) demonstrations. They play a critical role in the energy transition as their involvement is essential to have impact. In the last couple of months meetings were organised with citizens participating in Vehicle-to-grid and Virtual Power Plant to discuss progress and share learnings. 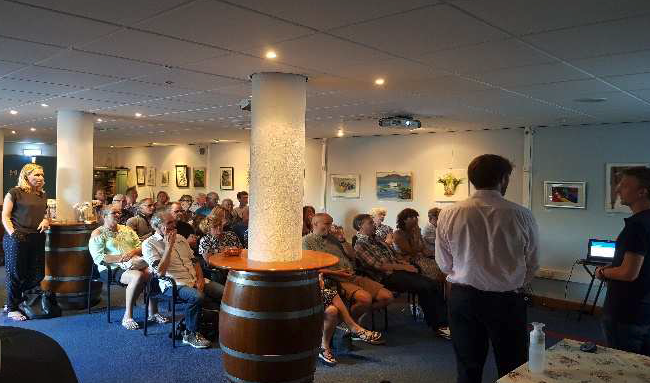 On a beautiful Friday evening, all parties involved in VPP (NeoSmart, Energy Exchange Enablers, Sympower, Alliander, Amsterdam Smart City) welcomed about 35 participants, our heroes and front-runners in this demonstration, to discuss the results and to respond to all questions and comments. As with all innovation projects, by trial and error we learn how the technical elements works in real life. For example, the impact of the VPP on the network in Amsterdam ‘Nieuw-West’ is being tested to learn about different levels in the electricity network. Coming months more tests and monitoring will take place. Another issue is that it has been shown that a stable data connection is difficult even while the battery is properly controlled. This creates insecure or missing measurements complicating the prediction of the VPP. Battery losses and heat development also have our full attention. As agreed with the participants, a lot of work will be done by end of the year, for example, improving the VPP for energy trading and analyzing the financial results of the energy trade. There was a positive response to this residents’ meeting; the possibility to ask questions and hearing about the status of the project were very much appreciated. There will be more communication about the progress and status with the participants in the next couple of months, including a second meeting in autumn. The objective of the event with Vehicle-to-Grid participants and residents was to discuss the new Vehicle-to-Grid charging technology that is being tested in their neighborhood. 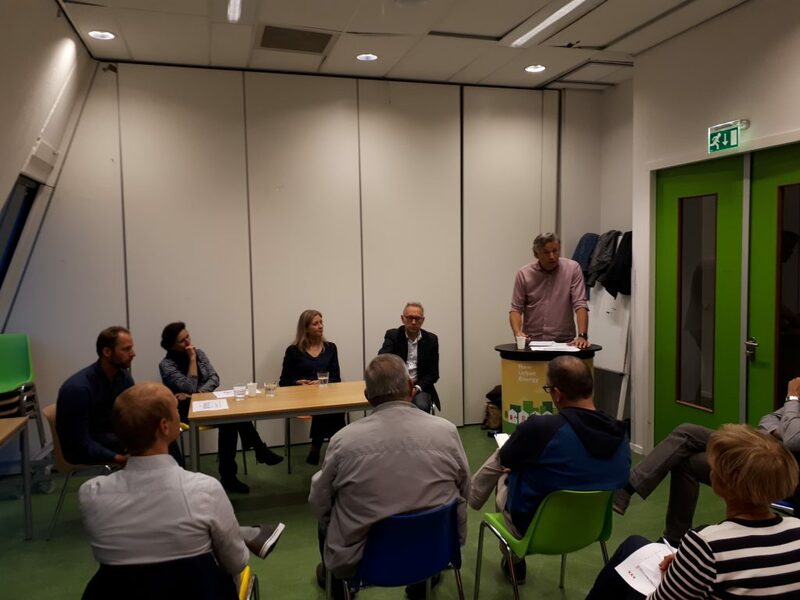 Experts from Alliander, NewMotion, Enervalis and Buurauto were present for a round table discussion, together with drivers of the electric cars participating in V2P and residents living in the neighborhood. The focus of this meeting was to give the neighborhood more insight in the prospects of Vehicle-to-Grid technology and to share progress. This to raise awareness that the district could use more sustainable generated energy and that the product lifetime of the electricity grid may be increased through the incorporation of new technologies in the grid. After the roundtable, the enthusiastic audience engaged in a pleasant discussion; what is Vehicle-to-Grid, what is actually being tested and why do we need this? Critical sounds were also heard, for example “who is waiting for a car to share, everybody in this neighborhood has at least one car themselves”. Interestingly, the critical observations were contradicted by proponents in the audience saying, “I have a bad feeling about owning a car that I hardly ever use”. One citizen had a formal complaint about the noise level of the V2G charger opposite his house, “while the car is not being used at all”. The team was happy this citizen was present at the event and explained why the charger was being used even though the car connected to it was not being used for driving. The citizen confessed he had interrupted sessions because he was convinced the charger was not doing anything except producing noise. We kindly asked him to refrain from pressing the emergency button in future cases of noise, because this causes the experiments to fail which results in delay and as a result extra periods of discomfort. The complaint itself is taken seriously and is being investigated further. Summarising, attendees turned out to be very curious and suggested a list of frequently asked questions and answers to be send to the entire neighborhood; this will create more awareness.